Todd and Barb’s Rapids Resort has a full service bar and restaurant offering daily lunch and dinner, weekend breakfast, home made pizza and other Italian specialties. Our dining room provides a nice view of the river. The bar and game room offer a juke box, pool table and video games. Visit our bar & gameroom page for more information. Todd and Barb’s Rapids Resort offers overnight accommodations in their 4 rustic cabins. Todd and Barb’s Rapids Resort offers seasonal lodging from mid-April through November right on the shore of the Peshtigo River. The authentic log cabins at Todd and Barb’s Rapids Resort offer rustic accommodations with all of the modern conveniences including hot & cold running water, gas heaters and modern bathrooms with showers. The beautiful dining room at Todd and Barb’s Rapids Resort offers a spectacular view of the Peshtigo River to compliment some of the best food in the area. The friendly, experienced wait staff tends to every detail to assure the best dining experience possible. Beautifully appointed in knotty pine, Todd and Barb’s Rapids Resort Bar and Game Room is fun-time central. Our large bar has lots of room for you and your group. Our Game Room offers a pool table and darts as well as a pinball machine and several video games for your entertainment. The Himalayan snow yeti hanging in the bar is known around the world. Todd and Barb’s Rapids Resort has a full service bar and restaurant offering daily lunch and dinner, weekend breakfast, home made pizza and other Italian specialties. Our dining room provides a nice view of the river. The bar and game room offer a juke box, pool table and video games. Visit our bar & gameroom page for more information. Todd and Barb’s Rapids Resort offers overnight accommodations in their 4 rustic cabins. These cabins are right on the river and are fully updated with modern conveniences. Available mid-April through deer-gun season in November, the cabins are within a few short steps to the bar, restaurant, raft company and campground. Visit our Lodging page for full details. Todd and Barb’s Rapids Resort has your needs covered if you are camping next door with Kosir’s too. Ice, packaged goods, food and drink and much more is available here for the visiting camper. Explore our website to see all that we offer and we hope to see you soon at Todd and Barb’s Rapids Resort in Silver Cliff, WI. The beautiful dining room at Todd and Barb’s Rapids Resort offers a spectacular view of the Peshtigo River to compliment some of the best food in the area. The friendly, experienced wait staff tends to every detail to assure the best dining experience possible. 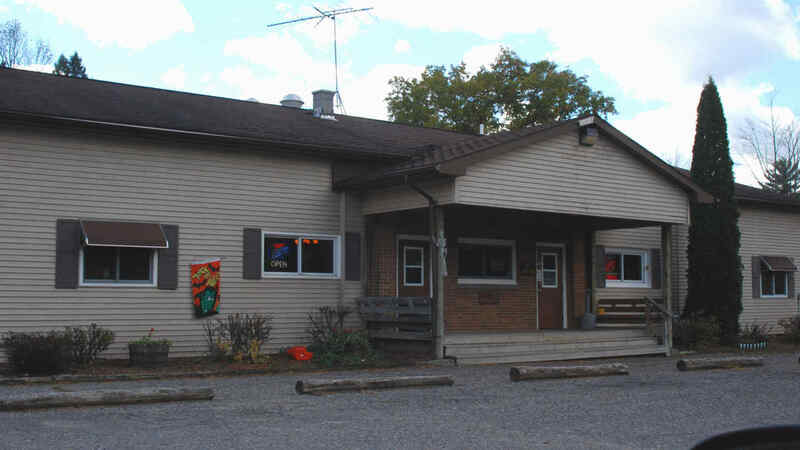 The Todd and Barb’s Rapids Resort offers a full menu with weekend breakfast, soup & salad bar on Friday and Saturday night, Friday fish fry, homemade pizza and several other Italian specialties. In addition, breakfast is served daily during the Gun Deer Season. Todd and Barb’s Rapids Resort offers seasonal lodging from mid-April through November right on the shore of the Peshtigo River. The authentic log cabins at Todd and Barb’s Rapids Resort offer rustic accommodations with all of the modern conveniences including hot & cold running water, gas heaters and modern bathrooms with showers. The main room in each of these cabins is a kitchen/livingroom combination. There is a couch and arm chair as well as a picnic table. The kitchen area includes a full sized range with oven, microwave, coffee maker, toaster and full size refrigerator. The cabinets are stocked with all the cooking and eating utensils you will need during your stay. Each cabin has 2 bedrooms, one with a full size bed and the other with a full size bunk bed, enough to sleep 6 adults comfortably. We furnish blankets and pillows. You will need to bring your own sheets, pillow cases and towels. Tonight we had the best shrimp dinner ever! They are as big as my thumb and you get 10 hand breaded. So good. It comes with a salad bar that was so fresh, and homemade clam chowder, that had to be the best I have ever eaten. Great food and great service!! Had a Awesome time, will be back next year for some more fun. First group of four to come spend 50$ at the bar get four tickets to Friday April 19th brewers dodgers game!! !